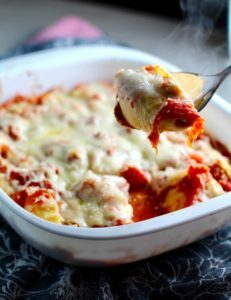 Turkey and Ricotta Stuffed Shells in Tomato Sauce are the perfect way to repurpose and transform leftover Turkey or Chicken. 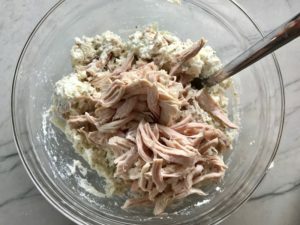 The Shredded Turkey combined with Italian seasonings, mozzarella, and ricotta is creamy and cheesy and delicious. 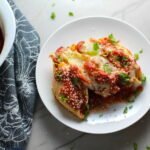 Stuffed in shells and topped with a simple tomato sauce and more melty mozzarella and nutty parmesan, it’s a perfect dish that the family will love! Make and eat or even freeze for later. I’m always looking to find easy ways to prepare dinner. And what’s easier than preparing a bunch of roasted chicken breasts and then using them in a variety of easy and different dinners. The trick is making sure that the flavors are different and exciting. 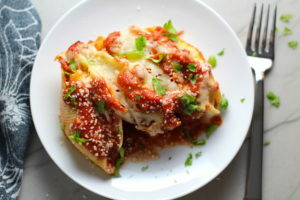 These Stuffed Ricotta Shells are perfect for doing just that! 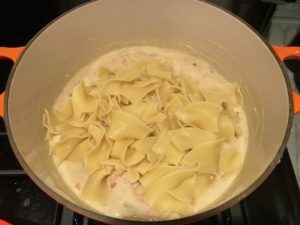 This dish is also a fantastic way to use leftover Turkey from Thanksgiving or Christmas! Simply shred the leftover meat, add it to the stuffing, and that’s it! 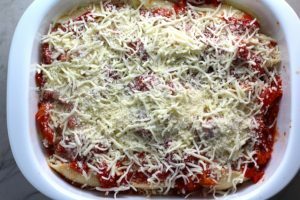 For this recipe, there is very little that you need to prep ahead, unless you are preparing the entire casserole and baking it later. I have made that assumption, but if you are immediately cooking, the instructions are to simply move it right into the oven.For this recipe, the intent is to use either leftovers, a store bought rotisserie chicken, or use chicken that you have roasted ahead for several meals. 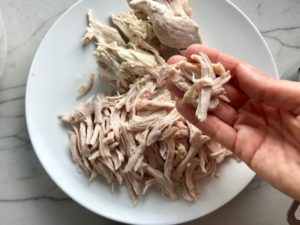 So, the first step is to prepare the already cooked turkey or chicken by shredding it using either your fingers (I think the easiest way) or using 2 forks. In a large mixing bowl, add all Filling ingredients except the shredded turkey and combine together. Once mixed thoroughly, add the turkey and fold in. 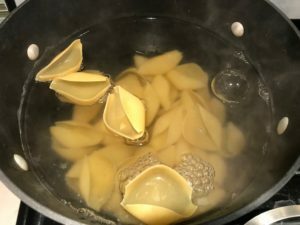 Cook the Jumbo Pasta Shells to al dente (not fully cooked). 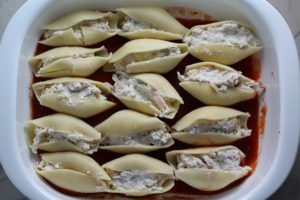 The shells will finish cooking in the oven. 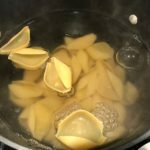 When the shells are done boiling, strain them and run cool water over them to stop the cooking. 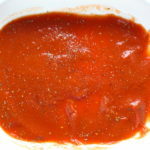 To a 9×11 Casserole Dish (3 Quart Dish) add a small amount of the tomato sauce from the whole tomatoes, just enough to cover the bottom of the pan. Spread the sauce around. Sprinkle a pinch of Italian Seasoning all over. 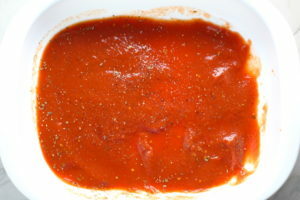 Make the Tomato Sauce by emptying the whole tomatoes and remaining tomato sauce into a bowl. Crush the whole tomatoes using a fork or just your hands/fingers. 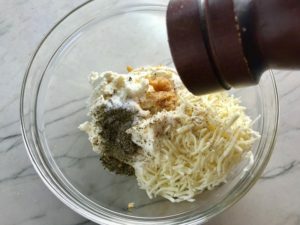 Add 1 tsp Italian Seasoning, 1 tsp minced garlic, 1/2 tsp salt, 1/2 tsp ground pepper. 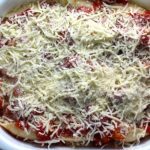 Stuff each of the pasta shells with some of the Turkey Ricotta filling. 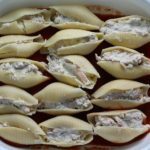 You want to try to get 15-16 shells stuffed (you probably will not have dish space or filling for more than this), so do not over-stuff, as you can always go back and add more stuffing. Also, I like to stuff first, then layer into the dish. It’s easier to go back and re-stuff before adding to the sauce. Once you have them all stuffed, start layering them in row by row starting with the short end of the dish and going across. 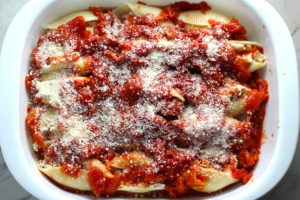 Pour the tomato sauce over the shells, then sprinkle half of the Parmesan Cheese on top evenly. Next sprinkle the Mozzarella evenly over top and the remaining parmesan cheese on top of that. Bake in a Preheated 350 F degree oven for 45 minutes. 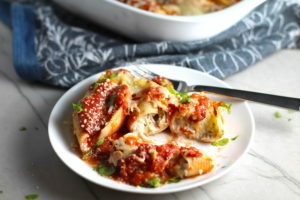 Turkey Ricotta Stuffed Shells in Tomato Sauce are the perfect way to repurpose and transform leftover Turkey or Chicken. 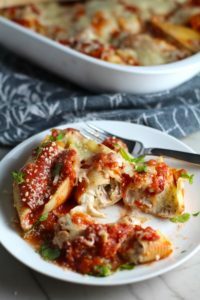 The Shredded Turkey, Italian seasonings, mozzarella, and ricotta are stuffed in shells and topped with a simple tomato sauce and more melty mozzarella and nutty parmesan, it's a perfect dish that the family will love! 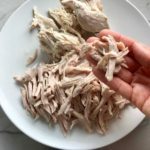 Shred Turkey or chicken with fingers or using 2 forks. 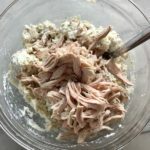 In a large mixing bowl, add all Filling ingredients except the shredded turkey and combine together. Once mixed thoroughly, add the turkey and fold in. To a 9x11 Casserole Dish (3 Quart Dish) add a small amount of the tomato sauce from the whole tomatoes, just enough to cover the bottom of the pan. Spread the sauce around. Sprinkle a pinch of Italian Seasoning all over. 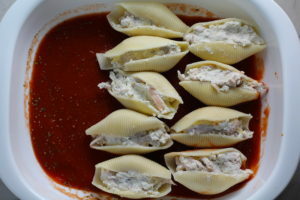 Stuff each of the pasta shells with some of the Turkey Ricotta filling. 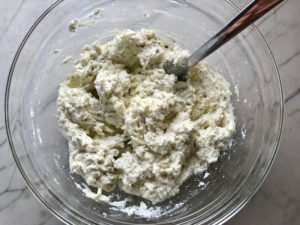 You want to try to get 15-16 shells stuffed (you probably will not have dish space or filling for more than this), so do not over-stuff, as you can always go back and add more stuffing. Also, I like to stuff first, then layer into the dish. It's easier to go back and re-stuff before adding to the sauce. 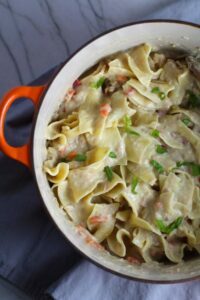 This Stove Top Easy Tuna Casserole is a creamy and delicious comfort dish. 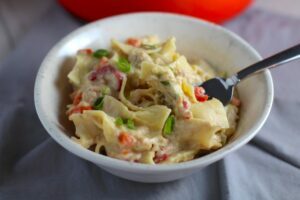 It’s full of flavor with tuna, carrots, scallions, cheddar cheese, noodles, and a surprise pop of sweet from Pimiento. 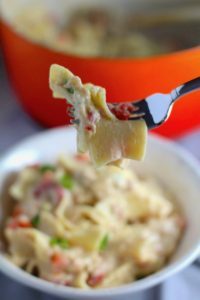 This recipe is completely from scratch (no canned soup here!) 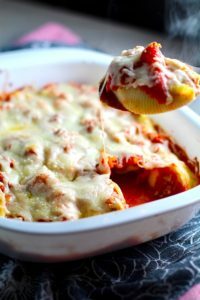 but I can promise you it’s so easy and only takes 30 minutes because it’s a Casserole that you can make entirely on the stove top! 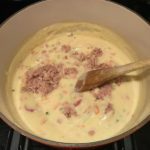 While you may not find a Tuna Casserole on a restaurant menu, it’s a warm, comforting, and yummy dish to make at home for dinner. 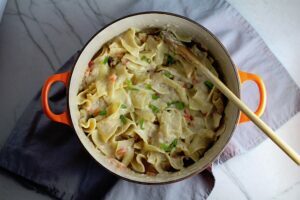 Growing up in the midwest, I think my Mom made Tuna Casserole nearly once a month and I always loved it. As I was going through her old recipes, I came across it and just had to create my own version. 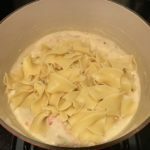 Yes, my Mom used a creamy soup from a can and it was yummy! 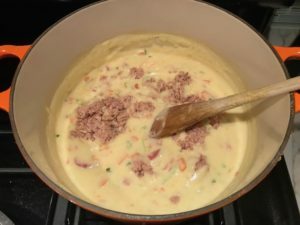 However, in my version, I created the creamy sauce by adding a bit of butter, flour, and chicken broth….and not only does it remind me of my Mom’s Tuna Casserole, but it might even be a little bit better (sorry, Mom!). Peel and Dice Carrots. 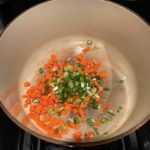 Slice Scallions. Store both in the same baggie or container in your fridge. 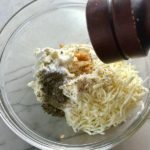 If your cheddar is not already shredded, you can shred it and measure out a 1/2 cup. Store in fridge. 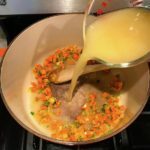 You can also open and drain the tuna fish and store in a container in the fridge, but this is such a quick step, you may just want to wait until ready to cook to do this. 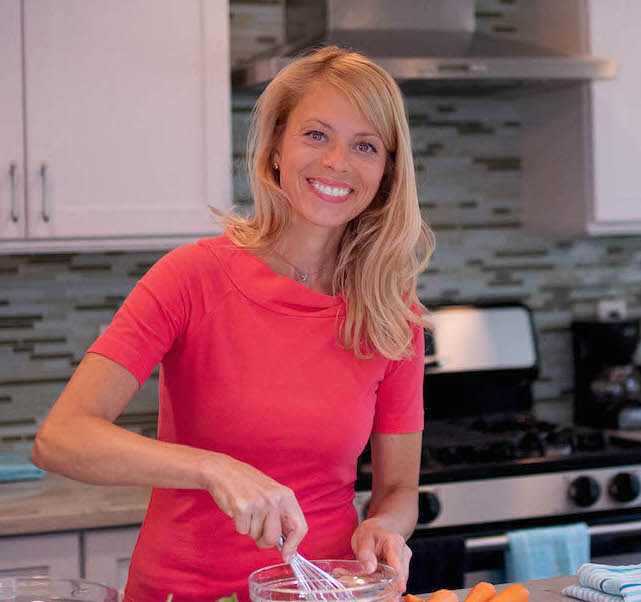 Ok, get ready for super easy cooking! Make the Egg Noodles according to package instructions, drain and set aside until ready to add to the sauce. You can be cooking the noodles while you are making the sauce. 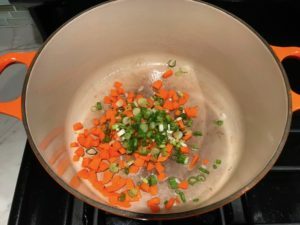 Preheat a dutch oven or soup pot, add the olive oil, diced carrots, and sliced scallions (SAVE SOME OF THE SLICED GREENS FOR GARNISH IF YOU DESIRE). Stir to coat with oil and cook for 4-5 minutes until the carrots start to soften. 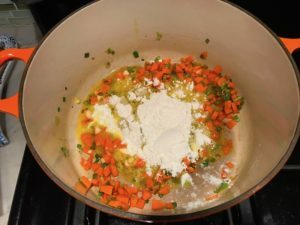 Add the butter and stir to melt, then add the flour and stir again to combine with the butter and coat the carrots and scallions. 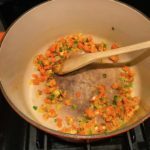 Cook for a couple minutes while stirring until the Roux starts to get golden brown, but don’t let it burn. 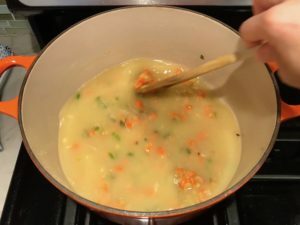 Add the broth slowly stirring as you add so that the roux mixes smoothly with it. 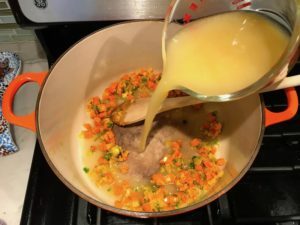 Turn the heat to a simmer.Once the roux and broth are combined and the sauce is starting to thicken (about 3-4 minutes) add the half and half (or milk) and stir to combine. Next, stir in the shredded cheese to melt, combine, and further thicken the sauce. Last add the Pimiento and then the tuna. Mix to combine. Mix in the cooked noodles and you are done! 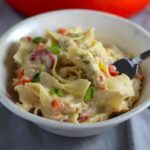 This Tuna Casserole is a creamy and delicious comfort dish with tuna and noodles and a surprise pop of sweet from Pimiento. 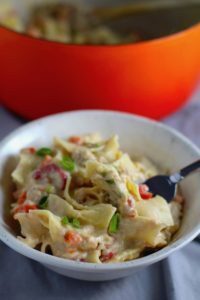 This version is completely from scratch (no canned soup here!) 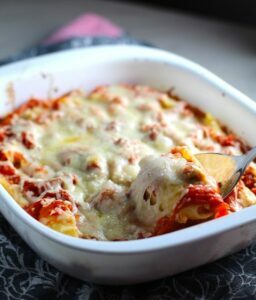 and I can promise you it's so easy and only takes 30 minutes because it's a Casserole that you can make entirely on the stove top! 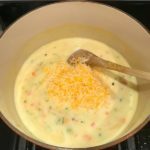 If your cheddar is not already shredded, shred it and measure out a 1/2 cup. Store in fridge. Open and drain the tuna fish and store in a container in the fridge. Measure out your Chicken Broth, as well as half and half (or milk). 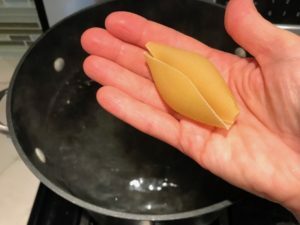 Make the Egg Noodles according to package instructions. Once cooked, drain and set aside until ready to add to the sauce. You can be cooking the noodles while you are making the sauce. 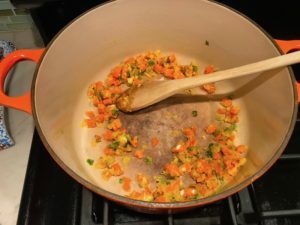 Add the butter and stir to melt, then add the flour and stir again to combine with the butter and coat the carrots and scallions. 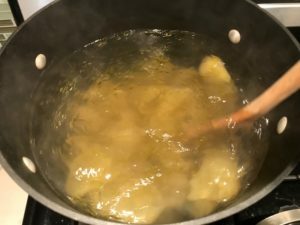 Cook for a couple minutes while stirring until the Roux starts to get golden brown, but don't let it burn. 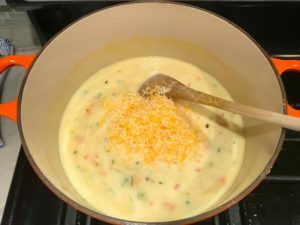 Next, stir in the shredded cheese to melt, combine, and further thicken the sauce. Add the Pimiento and then the tuna. Mix to combine. Last, mix in the cooked noodles.